Cattle. We grew up rooted in agriculture and the farm life. We are sowing the same values in Cole (age 9) that were started in us many years ago. We truly have a passion for animals and a drive to have the best and be the best in all our endeavors. 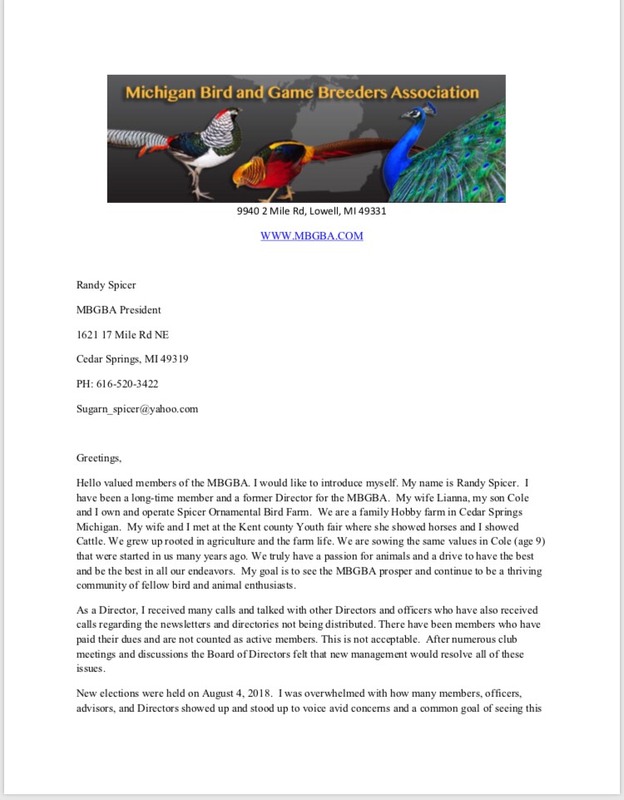 My goal is to see the MBGBA prosper and continue to be a thriving community of fellow bird and animal enthusiasts. As a Director, I received many calls and talked with other Directors and officers who have also received calls regarding the newsletters and directories not being distributed. There have been members who have paid their dues and are not counted as active members. This is not acceptable. After numerous club meetings and discussions the Board of Directors felt that new management would resolve all of these issues. advisors, and Directors showed up and stood up to voice avid concerns and a common goal of seeing this club restored. I was voted in as President and my wife Lianna was voted in as Secretary. Steve List was voted in as Treasurer. We also welcomed in new Directors to support the club and keep things running smoothly. Thank you Chuck Misket, Doug Upell, Jon Parm, and Joe Tersigini for seeing a need and not hesitating to help. The next question was how do we make this right with our valued members? 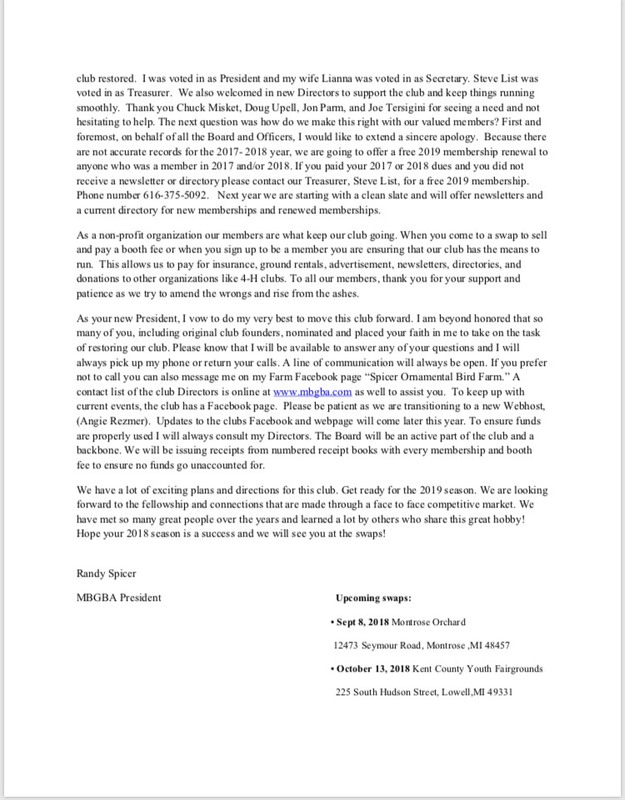 First and foremost, on behalf of all the Board and Officers, I would like to extend a sincere apology. Because there are not accurate records for the 2017- 2018 year, we are going to offer a free 2019 membership renewal to anyone who was a member in 2017 and/or 2018. If you paid your 2017 or 2018 dues and you did not receive a newsletter or directory please contact our Treasurer, Steve List, for a free 2019 membership. Phone number 616-375-5092. Next year we are starting with a clean slate and will offer newsletters and a current directory for new memberships and renewed memberships. As a non-profit organization our members are what keep our club going. When you come to a swap to sell and pay a booth fee or when you sign up to be a member you are ensuring that our club has the means to run. This allows us to pay for insurance, ground rentals, advertisement, newsletters, directories, and donations to other organizations like 4-H clubs. To all our members, thank you for your support and patience as we try to amend the wrongs and rise from the ashes. current events, the club has a Facebook page. Please be patient as we are transitioning to a new Webhost, (Angie Rezmer). Updates to the clubs Facebook and webpage will come later this year. To ensure funds are properly used I will always consult my Directors. The Board will be an active part of the club and a backbone. We will be issuing receipts from numbered receipt books with every membership and booth fee to ensure no funds go unaccounted for. We have a lot of exciting plans and directions for this club. Get ready for the 2019 season. We are looking forward to the fellowship and connections that are made through a face to face competitive market. We have met so many great people over the years and learned a lot by others who share this great hobby! Hope your 2018 season is a success and we will see you at the swaps!